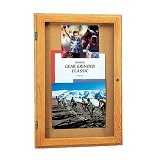 With our enclosed bulletin boards, visitors can see everything you display behind clear closed doors that keep contents safe and secure. 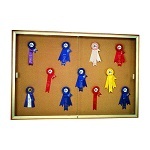 Select from a wide range of wood and metal frames that look great in any office, hallway or classroom. 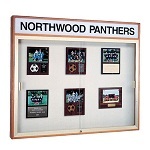 Display important plaques, awards, certificates, posters and announcements on your choice of cork, vinyl, fabric and other surfaces, or enclose a letterboard display to keep visitors fully informed.